Have you ever been curious about what a famous person's childhood was like? I really enjoyed this peek into the childhood of astronaut Chris Hadfield. This book is another of the nominees for the 2018 Blue Spruce Award from the Ontario Library Association. I read a copy from my local library. 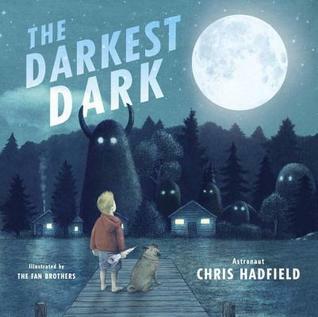 The Darkest Dark was written by Chris Hadfield and Kate Fillion, and illustrated by The Fan Brothers. It was published by Tundra Books in 2016. Chris was an astronaut. An important and very busy astronaut. This glimpse into Chris Hadfield’s childhood drew me in as a reader, especially showing Chris’ fears of the dark and aliens. It’s a nice example of a way to provide biographical information that can connect to a young child’s life experiences. I liked the gentle humor woven into this story: An astronaut’s work is never done, so astronauts do not like to sleep. But their parents do. It’s interesting to show students how a childhood dream can turn into reality – especially a big dream like becoming an astronaut. The links to history and the significance of the moon landing would be a good topic for research and discussion. Think: What do you dream of doing when you are older? Paint or draw a picture of your dream. Explore: Go outside and look at the night sky. What do you see? Research: What is your favorite planet? Create a poster to advertise your planet and invite visitors.